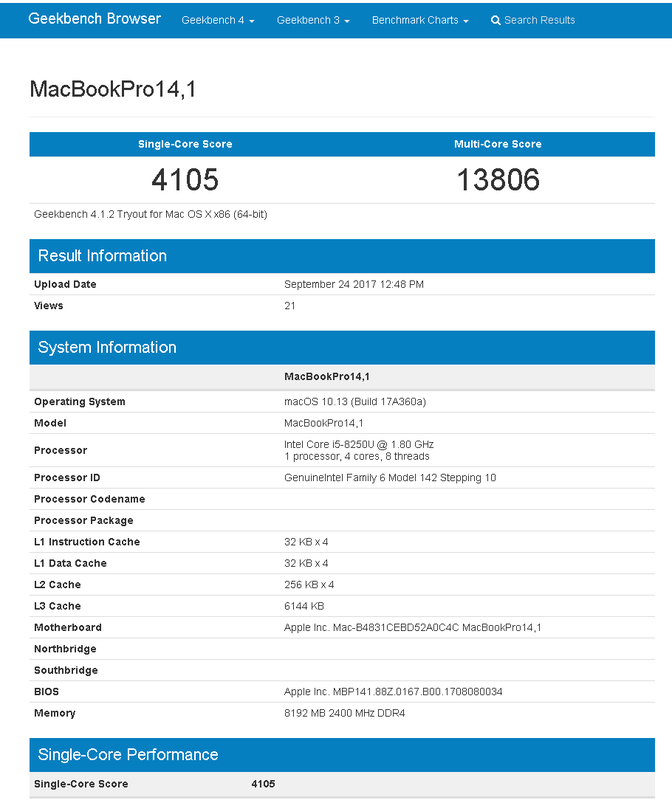 New unconfirmed entries point to an upcoming MacBook Pro sporting the latest quad-core Core i5-8250U CPU with 8 GB of RAM. Last year saw the introduction of the MacBook Pro series with unique Touch Bar features to distinguish the lineup from Windows notebooks. Fast-forward to late 2017 and new Windows notebooks now have the raw performance edge with the launch of ULV quad-core i5-8250U and i7-8550U options. Flagship laptops like the XPS 13, Spectre x360, Zenbook 3, and Yoga 920 with Kaby Lake-R are all either already available or coming soon to retailers. Unsurprisingly, it was only a matter of time before we would start seeing hints of a MacBook refresh complete with the same Intel 8th gen Core ix options. 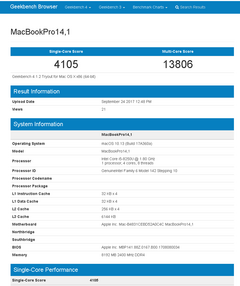 According to multiple Geekbench entries as listed below, the "MacBookPro14,1" will be coming with the 1.8 GHz Core i5-8250U CPU and potentially the i5-8350U and i7-8550U in higher-end SKUs. Multiple MacOS versions (10.12.6 and 10.13) and RAM types (8 GB 1800 MHz DDR3 and 2400 MHz DDR4) can be observed to suggest that the manufacturer is still in the process of tweaking hardware and software specifications to accommodate the new processor. Perhaps more interestingly, the "MacBookPro14,1" name has the possibility of being a new 14.1-inch MacBook Pro. The 15-inch MacBook Pro 15 models typically carry 45 W HQ-class CPUs while the 13.3-inch MacBook Pro 13 and 12-inch MacBook 12 models utilize the U-class and Y-class CPUs, respectively. It's nonetheless very unlikely that there will be a 14-inch MacBook Pro anytime soon and that the listings are instead referring to an updated MacBook Pro 13 series with new quad-core ULV options.